Memorial Day is over and we’re now officially in the summer season again. Whites are back. So are barbeques, picnics, ice-cold beers and leisurely simple meals. It’s time to dig out our recipes for cold summer dishes. But what can you do to jazz up the boring standard fares in your recipe collection? Why not add some Chinese cold dishes to your repertoire? 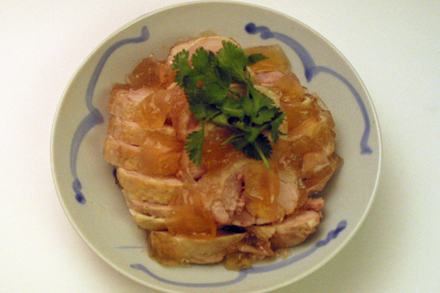 Drunken chicken (紹興醉雞), for one, can give your summer meals some extra pizzazz. Drunken chicken originates from Shaoxing, in the eastern coastal Chinese province of Zhejiang, which is renowned for its rice wine. Historical records of the Spring and Autumn period (two thousands years ago) note the superiority of wine from Shaoxing. These records credit the excellent local grains and pure lake water for the high quality of the wine. Unfortunately few modern wineries now utilize natural water for wine making because of pollution. Shaoxing still produces outstanding wine, however, given its ancient winemaking tradition and experience. Shaoxing wine is generically known as yellow wine (黃酒) in Chinese. With its light brown color and slightly sweet but tannic flavor it is very similar to sherry. A good Shaoxing wine can be very smooth and has excellent bouquet. It is served at room temperature or slightly warmed during the winter months, and is an excellent accompaniment for many spicy Chinese dishes. In addition to being served with a meal, Shaoxing wine is widely used in Chinese cooking as well. Drunken chicken in particular fully utilizes the intense flavor of this wine. The chicken is first marinated in a wine mixture then steamed until the gelatin from the meat dissolves into the juice. This juice turns into incredible aspic when refrigerated and is often served with the chicken. This dish is in fact great as snack for drinking because the wine flavor complements other alcoholic drinks very well. I often serve it as hors d’oeuvre, accompanied by other cold dishes such as five spice boiled peanuts and cabbage pickles, for a Chinese cocktail party. The recipe below makes an appetizer portion of drunken chicken. But you can double it and serve as a cold meat course accompanied by cold sesame noodles and Asian salad. So, here’s to summer… cheers! Marinate the chicken thighs in all the rest of ingredients for at least 12 hours. 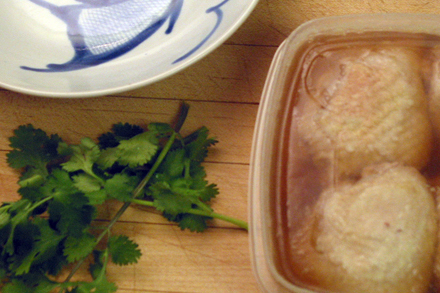 For best results marinate overnight in the refrigerator. When ready to steam put the chicken thighs on a deep dish and pour the wine marinate onto the chicken. Steam the chicken for 45 minutes. Then put the chicken and marinate together in a plastic container and cover tightly. Refrigerate overnight. The wine marinate will jell and become aspic. Scrape off the fat from the top of the aspic before serving. 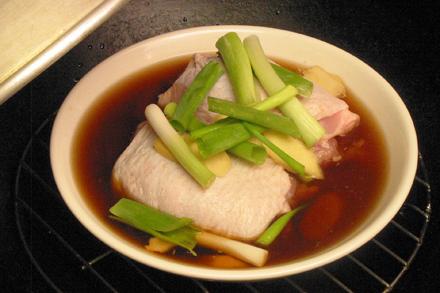 Cut the chicken into thin slices and arrange on a plate. Chop the aspic into small pieces and arrange around the chicken. Serve cold with cilantro garnish. I love drunken chicken wings. Some people find the pasty, flabby skin off-putting. Not you or I! 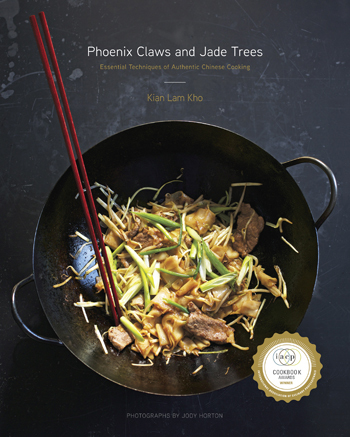 Do you have any recommendations for the brand of Shaoxing wine that can be used for this dish? Although we use Shaoxing wine on a fairly regular basis, we are not that discerning with it and usually buy the one with the red label. I notice that there are some different ones available though, so there might be differences that should be noted when making a dish that would have the wine as a primary flavour. I love drunken chicken but i never dared to make it myself. Thanks for demystifying it. Maybe i’ll give it a try now. It looks great! Looks so delicious. It’s one of my favourite meals but we always go to a local place in Sydney for it, never tried to make. Will definitely be putting this at the top of my list. Great reading your blog.